... and these tartan gloves! I persuaded Carlos to try on some of Nan's cool threads. So he went all out for the reflective suit. Now don't we make a cute couple? And how do those knickers fit anyway? Well, you can ask David. Navy blue with red pinstripes. So stylin'. 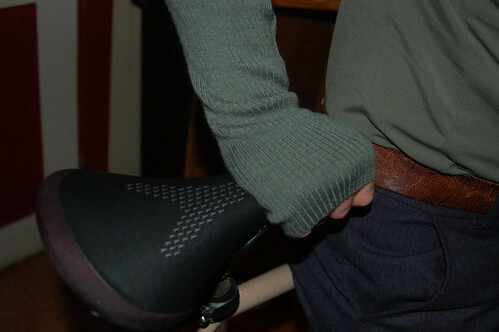 And his gray armwarmers are made from repurposed second hand cashmere sweaters. What a fun night - getting together with cycle chic-istas for some holiday cheer. Nan, Gwen, KT & Meli. 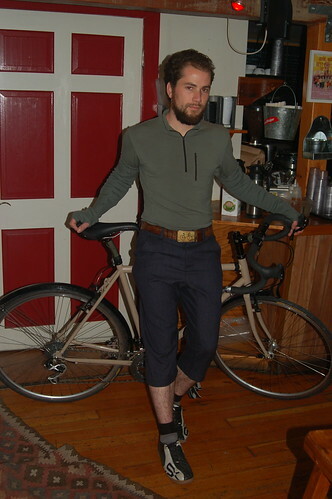 Whatever fashion fits your fancy--plaid, tweed, psychedelic or mod--always choose style over speed. Too much style for me! 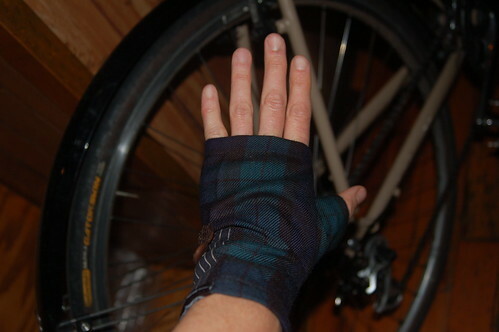 But I like the tartan gloves -- way cool. R.I.P. relationship. Oh well. Next!